Where do these items come from??? Let’s start with Mrs. Scratchy. She is from the episode, Loan-a-Lisa, S22E2. And what does that have to do with Mrs. Scratchy? Nothing. Except that the episode starts with an Itchy and Scratchy Cartoon that features Scratchy and Mrs. Scratchy. Boom. There you have it. Well worth a full character. At least as it pertains to some semblance of continuity, the “Disapproving Squirrel” is at least tied to a Simpsons character…Marge (could you tell by the pic?). “Itchy & Scratchy & Marge” is the twenty-second episode of The Simpsons and the ninth episode of the second season (S2E9). ―Marge’s letter to Roger Meyers, Jr. In short…they clean up Itchy and Scratchy (to the consternation of the Springfield youth). 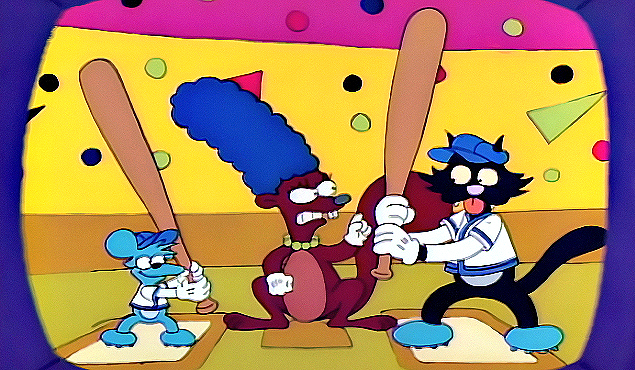 Poking fun at Marge, The Disapproving Squirrel is a parody, of Marge’s campaign against violence. But, again…she/it only appears for a few seconds. 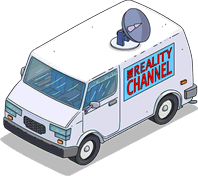 And FINALLY…we have the “Reality Channel” (Telling It Like it is NOT) which is a clear parody of the FOX News channel…a favorite target of the Simpsons. We also can buy the RC Van. These are both pretty tame/lame items…BUT…the van does offer pretty a substantial Bonus Multiplier…(as does Mrs. Scratchy) making it worth their hefty price tags. Mostly. The actual episode this is from has nothing to do with Itchy and Scratchy. “Helter Shelter” is the fifth episode of season 14 (S14E5). 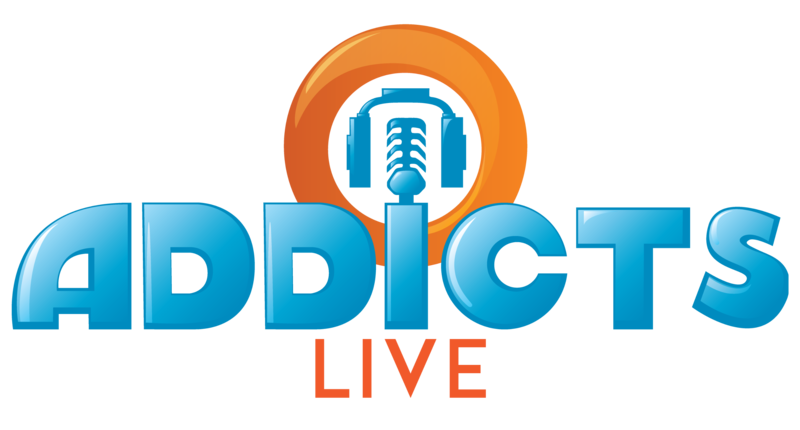 It originally aired December 1, 2002. The episode was written by Brian Pollack and Mert Rich and Mark Kirkland directed. David Landers guest starred as Squiggy (remember Lavern and Shirly?) and Larry Holmes (remember real boxing???) as himself. The network? You guessed it. And they apparently have a van. Sarah Wiggum appears in 24 episodes….compared to these characters and their unmemorable “screen blips.” I for one would really like to sit in on a meeting of bigwigs who decide this stuff…because, they are clearly just trying to make us mad. Sarah. Give us Sarah. And while we’re at it… GET RID OF THE ITEM LIMITS! Sorry…you knew I had to throw that one in…right? What do YOU think about these “prizes” as opposed to Sarah? Let EA know what you think!! 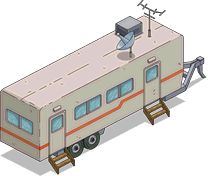 This entry was posted in Tapped Out, Where Did THAT Come From and tagged Disapproving Squirrel, Mrs Scratchy, Tapped Out Tips and Tricks, The Reality Channel Van, The Simpsons Tapped Out, TSTO, TSTO Addicts, TSTO Community, TSTO The Reality Channel, TSTO Tips and Tricks. Bookmark the permalink. I always thought that in the Tapped Out reality, that Sarah Wiggum was just a persona Clancy adopted on stakeouts Mmm steak out. With how long the game has been going and how many characters they’ve introduced (well over 200), I don’t think we can fault them for having to dig deep for characters to add. With the exception of episode tie-in’s, EA has barely scratched recent season characters. (I blame all the grousers who think that Simpson’s went downhill after Season 8, maybe Season 10, yet somehow 20 seasons later they’re still on the air…) They could base a whole event on Season 27, Ep.6 Friend With Benefit alone. For characters you could Lisa’s imperialist friend Harper Jambowski and her dad. We could get a new act for our pop stage, the Australian boy band. “Evan eht Nioj” David Copperfield is even in that episode. For buildings you have Dad’s stadium and omg, a private island! Really, a chain of them. I would love an island I could design. Smaller prizes could include Lisa’s bicycle and the self lifting chair. And that’s just one episode. TSTO still has a ton of potential stored material. Even in this last mini event the dialogue made jokes about jumping the shark. I think that’s why EA hasn’t released Sarah. We know out of deference to Phil Hartman we’ll probably never see his characters in the game and I respect that. Sarah is the only major character they haven’t released. There is something to be said for ‘always keep them wanting more’. It’s all somewhat amusing to me, honestly. 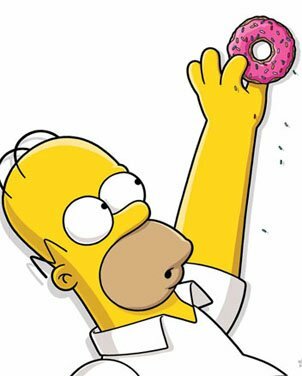 I started a little after most of the other Big Fans(TM) of the show… but even with that, I’ve reached the point now where I can buy pretty much any donut-based item that I want. As such, there are only three things left in the “Characters” category for me to buy — and two of those are just skins. Mind you, I still don’t have all of the “limited time” characters, but I figure those few still outstanding will probably make an appearance in a Mystery box at some point in the near future. I must admit I don’t get Team Sarah. She may have been in more episodes but I can’t think of a single time she’s actually been relevant to the plot of an episode. Some of these one offs really are “why are they here”, like Mrs. Scratchy, but Poochie, Roy, Squirrel, etc all part of some scene or gag relevant to their episode’s plot, even if briefly. If you haven’t figured it out yet… it’s mostly because we believe in family units. Ralph is needs his mommy. Right? But, actually…it has more to do with bracket battles, and overall wih lists. She is simply long overdue. Mrs Scratchy actually appeared several times in the series, even the movie. One of my all time favorite Simpson’s lines comes from Ralph Wiggum: “That’s how mommy looks after a box of wine!”. That alone is worth having Sarah Wiggum in the game. Disapproving squirrel is so brilliant and such a key part of a classic top 25 episode. Yes, it’s a side character, but that’s where we are with the game. Name a character that’s has not been added that has seen 15 minutes of screen time. So mega thumbs up for a full character that was super cheap and is mentioned every time my friends talk about classic Simpsons episodes. If only we could get every bit character for <75 donuts. I agree. Disapproving Squirrel is brilliant, and Marge’s reaction to her is classic. There are so many 10 second characters that are fun. I want Tobias, the sweet Australian boy who runs for 6 hours to check on the neighbors toilet. That kid makes me laugh every time I see him. Patric, Patric, Patric. Relax. Become one with the universe. Ooooommmmmmmm. Ooooooooooooommmmmmmm. I’m sure that the item limits are there for a reason, and that reason probably is game performance. Think about those people who had nasty system lags with the I&SL rides. Too many items to keep track of, and the system will bog down. EA wants an overall positive experience with the game, and that ain’t gonna happen if everyone is bogging down. That would make sense if tappers at level 65 (very few items) weren’t experiencing the same lags and freezes as those at level 939 (lots of items). I just put almost everything in storage to re-design my town…probably have less then 500 items out…and I’m still experiencing the same data glitches I ran into when I hit the item limit. No lagginess, but then I didn’t have any before I stored everything. There seem to be issues/conflicts within the programming that have nothing to do with how many pieces are in your town. The heritage programming is under duress. No doubt about it. One off or not Disapproving Squirrel and Roy are two of my favorite characters. 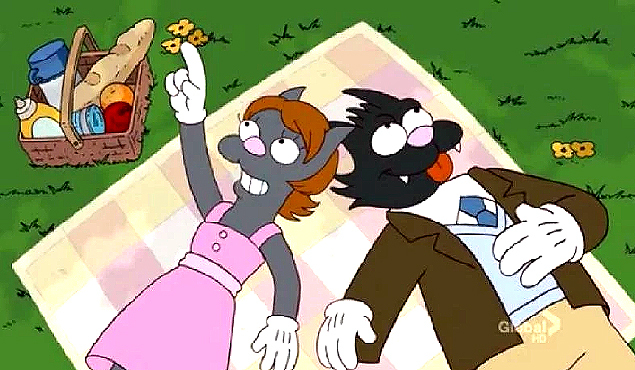 As the wiki states, Mrs Scratchy actually appeared in quite a fair number of episodes, debuting in Bart’s friend falls in love all the way back in season 3. You should complain more about Ms. Mouse who only appeared for a couple seconds in one single Itchy and Scratchy cartoon. My guess is Sarah Wiggum will be the last big cash purchase right before they shut down. That was some years ago…. Not a fan of the limits. Have I mentioned that before? I would like to see Sarah and I suspect there is a method to their madness with her arrival imminent, but I appreciate the additions of random, rarely seen Characters, even if I do not purchase them all. It may be easier to consider them background/extras. 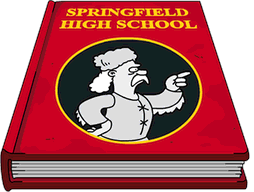 What would our Springfields look like if they were populated by only 40-50 core Characters? Probably about as lame as a big budget epic disaster film that took place in Manhattan, populated by nobody but the three main characters. I have 250 Characters, and at any given moment, most of them are indoors with my town so large I can only see a few at a time. Without the superfluous Characters, it would look like a post-Apocolypic graveyard. Strange that SW would be left out for, what, seven years that this game has been going? I wonder if there’s more to that story. If I may add, perhaps either give us enough “free” land tokens to come closer to the number available….or allow us to buy them with donuts? I, for one, would spend legal tender on that….there, now I’M done. Can’t understand why you can’t at least buy them with donuts? I agree with Patric and have said many times before in the past GIVE US SARAH WIGGUM.